I always keep 2 cans of chickpeas in the house, so that I can make hummus whenever I want. Last week, I bought 2 cans of chickpeas at the grocery store, and last night, I tried to make hummus with them. I opened the first can and started to pour out the liquid, and one of the “chickpeas” fell into the sink, looking very little like a chickpea. That’s when I read the label. I had purchased 2 cans of “great northern beans,” whatever those are, by accident. So I did what all normal Millennials do: I googled them. Apparently, great northern beans are a mild type of white bean, so in the interest of “waste not, want not,” I decided to cut my hummus-losses and make this “white” chili (it ceases to be white as soon as the paprika goes in), to bring to work for lunch this week. What a lucky mistake I made that day at the grocery store–and what an awesome chili! 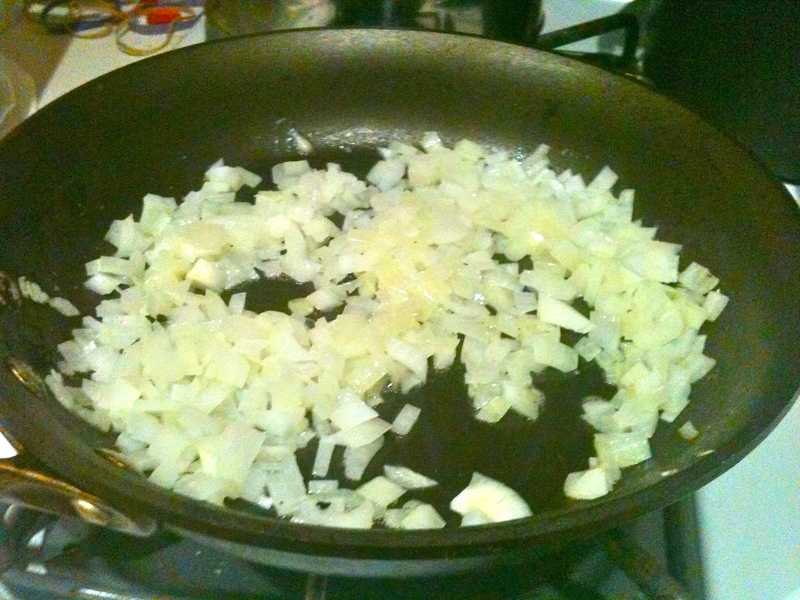 In a skillet over medium heat, melt half the butter and cook the onions and garlic until soft. 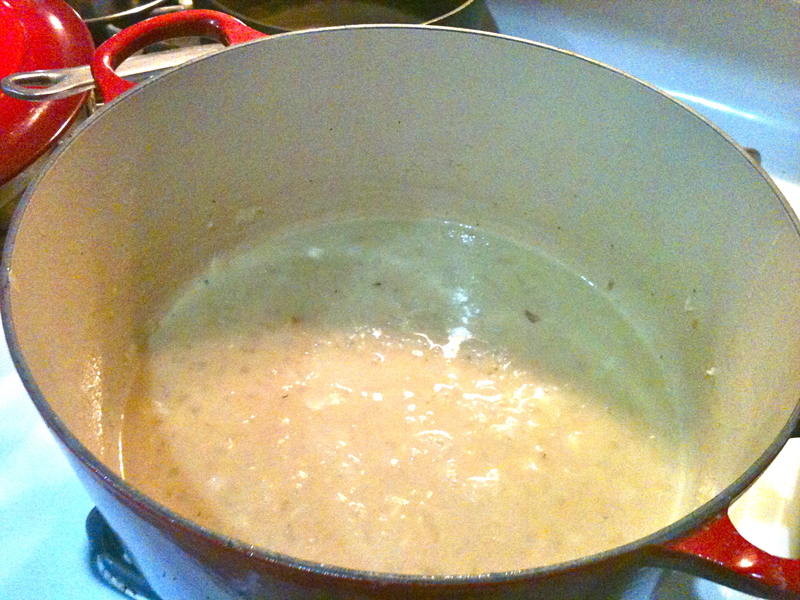 In a Dutch oven or other large pot, melt the rest of the butter over medium low heat and whisk in flour. 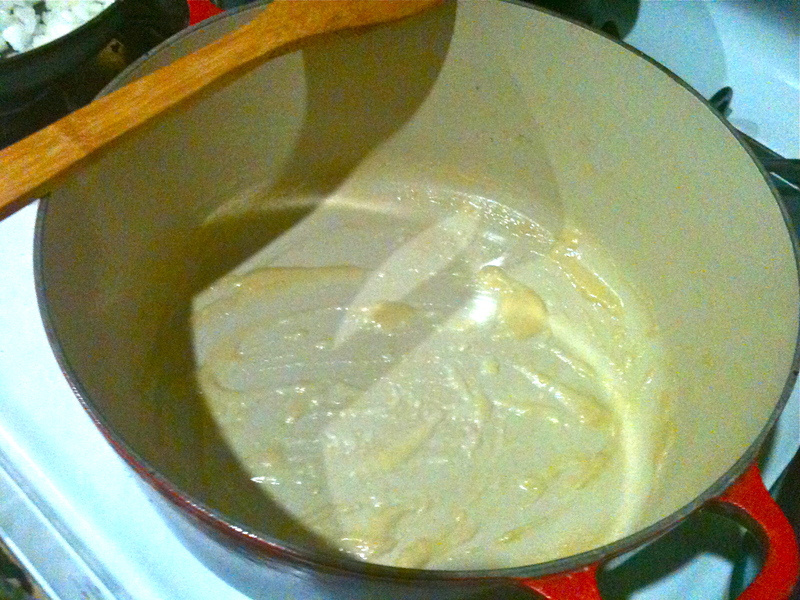 Whisking constantly, cook roux for 2-3 minutes, until it turns slightly darker in color. 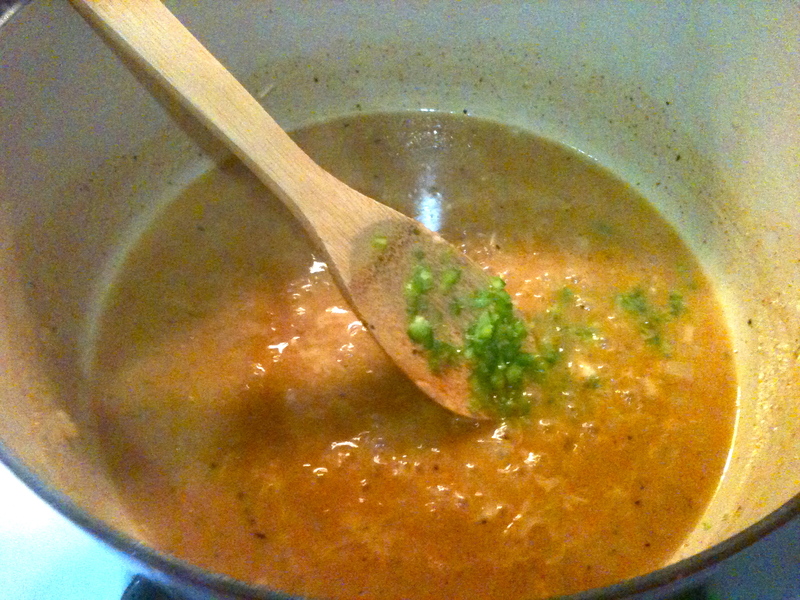 Stir in the onions and garlic, and gradually stir in 1 1/2 cups of stock, stirring constantly. Bring to a boil and simmer 5 minutes until thickened. 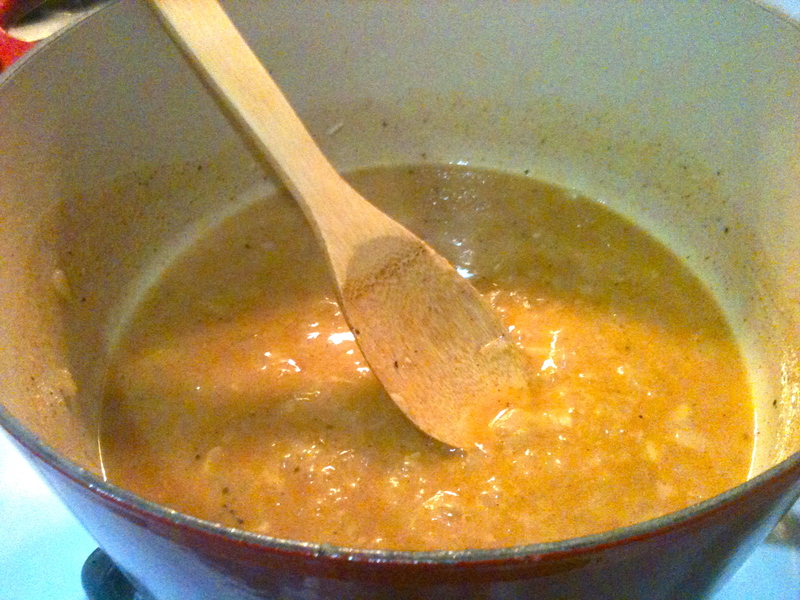 When the stock has thickened, stir in the spices. 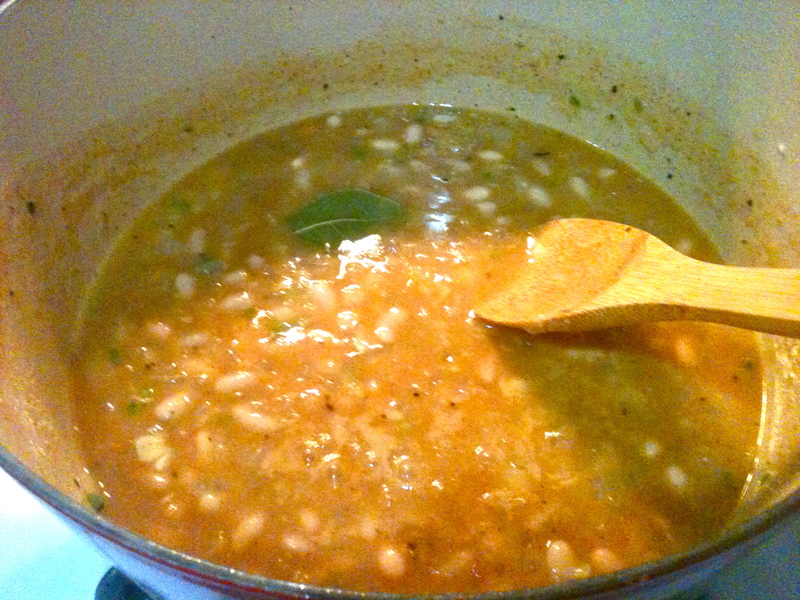 Then stir in the beans and throw in your bay leaf. *If you’re feeling fancy (and happen to have a Parmesan rind on hand), toss it into the chili now. Simmer for 20 minutes. After 20 minutes, remove bay leaf and Parmesan rind, garnish with sour cream and chopped parsley, and serve. This recipe doubles (or triples) very well, so make as much as you want! Previous Bacon and Egg Salad. Next Herbed White Bean Dip. Totally simple–and only about half an hour in front of a hot stove on a hot hot summer day! 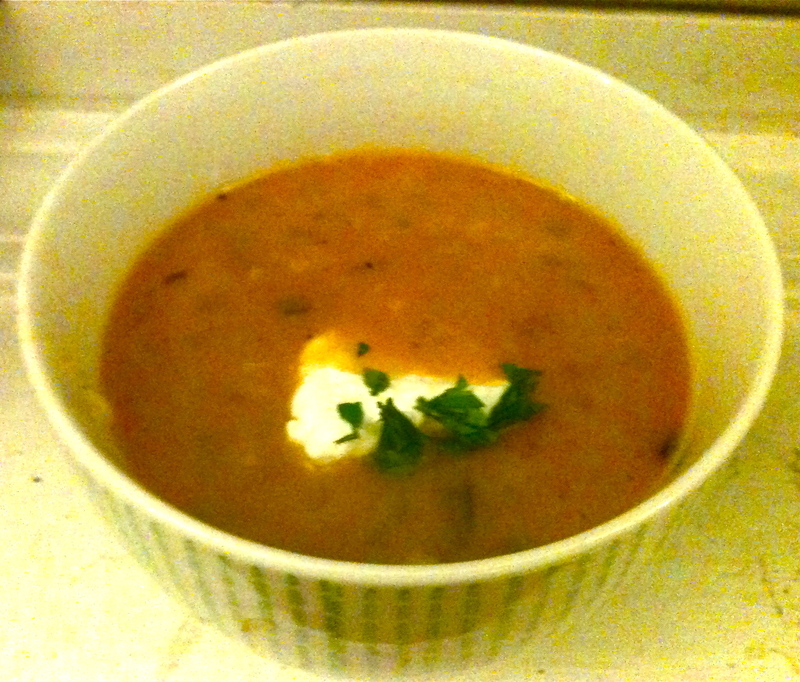 I like great Northern beans for soups and also for dips. I love the idea of a dip! Maybe that’s what I’ll do with the 2nd can of these babies…. With olive oil, garlic, lemon juice, salt, pepper, herbs, etc. Yum. I’ve been enjoying your blog! We will be making this ASAP ! Katie and I are going to make this this week!!! 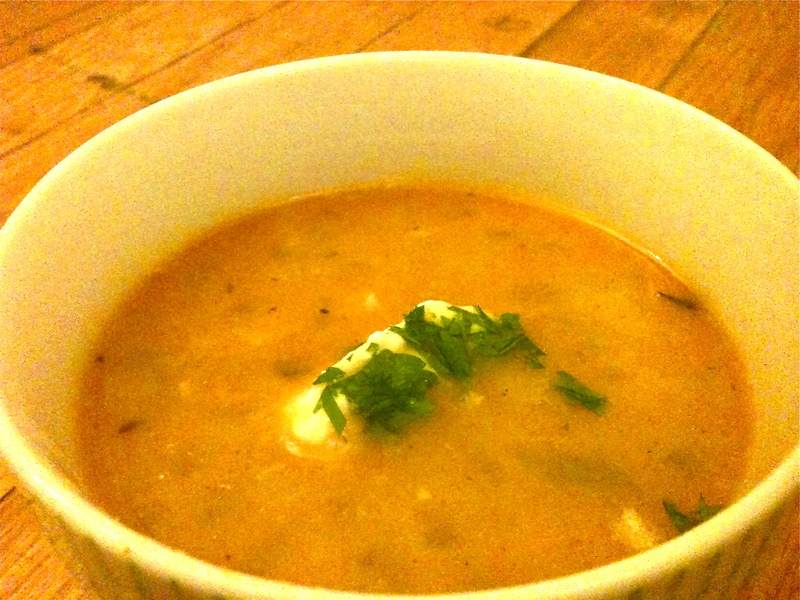 With weather this week…..nothing like chilly…I mean chili!! Thanks for sharing your great and tasty passions Kel! Let me know how your chili turns out, everybody! Love to hear variations if anything comes out extra yummy. Your accidental purchase paid off with a nice sounding chili.